If you’ve been hunting high and low for the perfect print for your child’s nursery or perhaps you’re after a gift for a new baby, then I’ve found the solution in these fuss free, easy styling personalised prints. With Evie The Elephant you can create gorgeous personalised name prints for girls and boys which will brighten any child’s room. All you have to do is choose a colour and add your name and the folk at Evie The Elephant will do the rest. If your little boy or girl is partial to a particular theme that’s not offered in the shop they can help you out there too by creating something especially for you. A stunning alphabet print is available which makes a great addition to older kids’ rooms as well as nurseries. Featuring fun letter icons and graphics, it comes in pretty pinks, bold blues or a funky mix of red and blue, all on a contrasting white background. All artwork is available on either thick semi-gloss paper to frame yourself, framed and ready to hang, or on canvas. 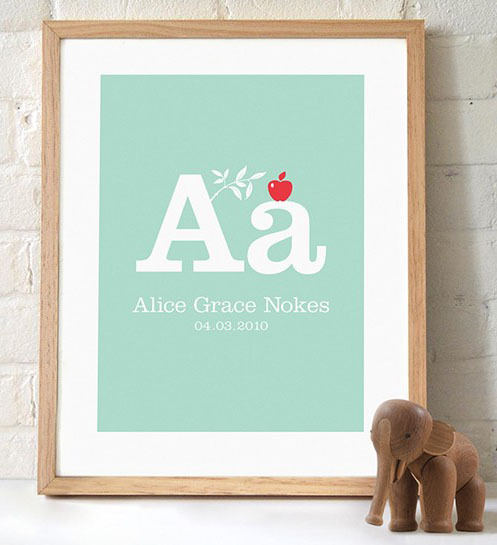 The personalised nursery print is $27 and a framed alphabet print is $85 from Evie The Elephant. Getting your hands on one of these is easy, with delivery available all over Australia.